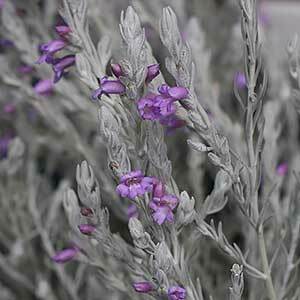 With silvery grey foliage and near purple flowers, Eremophila nivea is an outstanding native plant. Easy care, especially the grafted varieties in a sunny position and a well drained soil. A favourite species for its year round appeal, Eremophila nivea has very attractive silvery grey foliage as well as mauve to purple flowers. As far as Australian native Plants go, this is right up their with the best. The foliage looks great all year round, the flowers contrast well and the plant forms a dense bushy shape. To add to the attraction it attract Bees, Butterflies and Birds to the garden. A few slight variations in foliage and flower colour do occur, however all varieties make an impact in the garden. Eremophila nivea ‘Blue Velvet’ and Eremophila nivea ‘Beryls Blue’ are the two named varieties most widely offered for sale. Look for grafted varieties, especially if you are growing them in the eastern states. Water after planting and lightly mulch. Prune lightly directly after flowering to maintain a bushy habit and encourage more flowering shoots. You can grow Eremophila nivea in containers, you will need a specialist native plants potting soil, or at least a very free draining mix. Prune by removing the spent flower heads to maintain good shape and increase flower production. Tip prune often to to promote more flowers. Common Names – The Emu Bush, Silky Emu Bush. Flowers – Mauve to Purple.